Tongues can be a topic more dividing than the flames that appeared over the heads of believers in Acts chapter 2. But it need not be so. While it has been an issue of contention among believers in Messiah throughout the ages, it should rather be a topic that can be presented simply and in a self-evident fashion, and in such a manner that preserves the wonder accompanying any righteous spiritual event experienced in our lives. The topic of tongues is mentioned specifically in its spiritual gift format twenty-six times in the texts of the New Covenant. It possesses a unique place among the gifts in that it is spoken of more often than the others. Ironical it is that even with this prevalence of mention, it is the most isolated of the gifts given by the Spirit. All others are displayed quite evidently throughout the span of the Word. Tongues alone seems to be relegated to the New Covenant texts when it is discussed. However, this should not be the case. The reality of this gift is that it is much more ancient than the giving of the Spirit at the Temple on the festival that commemorates the giving of the Torah at Sinai in the second chapter of Acts. Once we find out where it is in the text and what to look for, this mysterious topic might be just a little less mysterious. Hopefully, by the end of this study, once all the details have been presented, we can walk away rejoicing in whatever language is upon our lips. The key to understanding the gift of tongues is held in looking at a detail of Acts chapter 2. The text tells us in 2:1-4 the timing of the events was not arbitrary, but was important in the eyes of the Father. It was the time of Pentecost, that is, the Greek way of referring to the Biblical festival known in Hebrew as Shavuot, which means “Weeks.” Shavuot / Pentecost is a memorial for the giving of the Torah which happened at Mount Sinai after the people of Israel fled Egypt. The event is recorded for us in Exodus chapters 19 and 20. When the proper timing is surrounding the events of Acts 2, we can return to the original event in Exodus and begin to see the truth of the gift of tongues. The first part of the Torah that the Holy One gave to the people on Shavuot was the Ten Commandments. Before all the detailed laws were implemented, He presented the core nature of the covenant: it would shape a person's spiritual and social life, so that we might be able to draw near to His Presence. This list of the Ten Commandments is first found in Exodus chapter 20. This is where we start. Specifically, we must begin in 20:1, for it tells us who is speaking to the people of Israel. And all the people saw the voices, and the torches, and the voice of the ram’s horn, and the mountain smoke. And the people saw, and they moved, and stood far off. The text here tells us the people experienced “voices” in this event. The term in Hebrew is QOLOT. It literally means “voices,” although most translations choose an entirely wrong definition of “thunder” to go in their particular version. It cannot be emphasized enough that QOLOT absolutely does not mean “thunder,” but clearly and without question “voices.” The choice to translate it in a misleading manner has caused the true reality of this passage to be missed for millennia. They unequivocally state that it had been Elohim alone who was speaking at the giving of the Ten Commandments, yet there was something unnatural about this aural event that made them not want to hear any further. Something about His voice was too much for the people to handle. Granted, it was their Deity speaking to them, but they had already seen amazing sights and miracles from His hand prior to this event, even having Him speak to them all at the mountain in the previous chapter, and they did not react in this odd manner, so it is proper to understand that their reaction was based on a totally new factor in the mix. These words YHWH spoke unto all your assembly on the mountain; from the midst of the fire, the cloud, and the thick darkness was a magnificent voice, and He added nothing. So, what was going on? How does this fit together? How can One Entity speak with a singular voice that is also described as voices? The text of Scripture helps us to further understand exactly what was happening when we look at two seemingly insignificant details from the two lists of the Ten Commandments. The wording of the Ten Commandments between the two lists is essentially identical. However, when we come to the command concerning the seventh-day Sabbath, things strangely change. Let us not ignore this subtle change, for it allows us to develop the proper picture of what really was happening to us at Sinai. The highlighted word is ZAKHOR "remember." The highlighted word is SHAMOR "guard." The commandment of the Sabbath begins two different ways between the two passages, yet Exodus records the words as given by the Holy One, and Deuteronomy likewise tells us that He spoke these specific words. There can be no disagreement, there can be no error. The inspiration must not be denied. ​How is it to be explained? 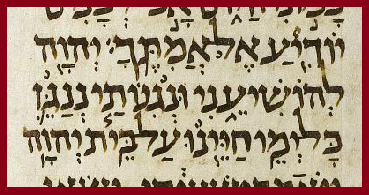 If we cannot deny the inspiration of this dual expression concerning the Sabbath day, then this detail would seem to suggest that both words were somehow used on Shavuot at the giving of the Ten Commandments. How can this be? ​The detail given by the people in Exodus 20 that He spoke with “voices,” if paired with this reality of two different words used to initiate the same commandment, means that His “magnificent voice” was, in fact, the miraculous utterance of multiple voices being emitted from a singular Being at once! When He spoke the Ten Commandments, although He alone was speaking, He was supernaturally uttering more than one word at the same time! This is nothing less than the gift of tongues, a miraculous form of speech, spoken by the Creator of all tongues, Himself! As He poured His Law into them, His Spirit used a speaking method that could not be explained, but demonstrated His own power to every single person there! The single most epic spiritual event in the history of mankind was delivered to us as we stood underneath the mountain using nothing less than the spiritual gift of tongues. What a beautiful truth to know. Even the Jewish teachers of old caught the astonishing reality of this detail and had to mention it in their discussions. The Talmud, Shevuot 20b, records their reference to this unique speaking ability of the Most High. The rabbis believed, due to these precise evidences from the text, that He spoke one magnificent utterance at Sinai on Shavuot, yet more than one utterance was heard by the people. He conveyed more information than was naturally possible by using a miraculous form of speech. The general view of this event in Judaism is that He actually gave all ten of the commandments in just one miraculous utterance, and the reference to this dual speech is not to be limited to just these two words! 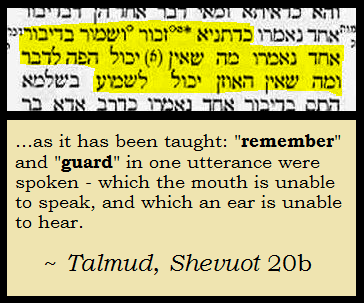 Again, the Talmud, in Shevuot 20b, preserves the fact that this detail was known and taught in ancient Judaism! This view of the rabbis that it went beyond merely the speaking of two words at once is further shown in the information given concerning the Sabbath day as recorded in Deuteronomy 5:14, which is slightly more detailed in specifics than the information given in Exodus 20:10. The Holy One spoke in a way that simultaneously allowed for multiple details to be shared to His people while speaking in one supernatural utterance. In fact, in the book of Psalms 62:12, David even mentions this spiritual gift of the Holy One in a brief and often overlooked statement. ​Elohim spoke once, twice I have heard this, for power is unto Elohim. The power of the Most High is revealed in how He communicated to the people at Sinai. He spoke a language that everyone understood, whether they were fluent in Hebrew or Egyptian, or whatever language was spoken by the mixed multitude, and He did so in a miraculous manner that contained more information than was humanly possible to give or even receive. This manner of tongues is exactly what we read about in Acts chapter 2, where the mixed multitude from the nations who have gathered at Jerusalem to celebrate the giving of the Torah are able to hear the message of the disciples of Yeshua in their own native tongues. The parallel is blatant. By properly understanding the Hebrew text, and not misleading ourselves with faulty translations of terms whose definition has no question, we see the truth of tongue revealed right in the Torah. He spoke with a “magnificent voice,” that is, one utterance that contained multiple voices, so that levels of understanding could be relayed, layers of meaning conveyed in one proclamation, and in all this, He spoke not just to all of Israel in a language they could understand, but also to the mixed multitude who had come out of Egypt with them! The greatest single tongues event in history was at Mount Sinai, when the Holy One Himself spoke in tongues to deliver the beginning of the Torah to over one million people. The Ten Commandments, therefore, we see were spoken to mankind using the gift of tongues! The gift of tongues began with the Most High, to be sure. There is a reason it is labeled in the New Covenant texts as one of the gifts of the Spirit. It is His gift. Man’s first encounter with the gift of tongues was experienced directly from Him using them to address the people in a way they could all understand. One can only give a gift of what one himself possesses, and so the gift of tongues that we see the Holy One has He is able and willing to give to His people as He so chooses to benefit His Kingdom. He used this gift to present His precious Ten Commandments to us at Sinai, and for that, we will be forever grateful that He delivered those laws through the power of the Spirit, for what is spiritually given must be spiritually utilized. This gift of tongues is seen elsewhere in the Hebrew Scriptures, and understanding these other appearances helps us to see the link to its full expression in the New Covenant texts. While the gift as displayed in Acts chapter 2 regards known languages being spoken in a miraculous way for the understanding of others, just as the Holy One performed at Sinai by giving the Ten Commandments in such a manner, the gift of tongues is mentioned later in the Word by Paul in 1st Corinthians 14:14-15 as also functioning in a more personal, intimate fashion, where understanding is far more limited in scope, but still intended. ​14 For if it is that I am praying in a tongue, my spirit is praying, yet my understanding is without fruits. 15 What, therefore, shall I do? I shall pray with my spirit, and I shall pray also with my understanding, and I shall sing with my spirit, and I shall sing also with my understanding. In this case, it is where the sounds that come from the individual using the gift are not readily understood by everyone around him, nor even sometimes by the speaker himself, but are made known to at least one intended person present. This function of the gift of tongues is widely called “ecstatic tongues,” but is a misnomer, as the gifts of the Spirit are always under the control of the individual, as Scripture makes clear. In this secondary function of tongues, it can be performed in vocalic nature as sounds, or it can take the form of a song, as the above verses make clear that one can pray in a way that their mind is not understanding, and sing in a way that their spirit is communing. This secondary usage of the gift of tongues is admittedly not quite apparent just from a surface reading of the text itself. Rather, one must understand Jewish spiritual culture to properly view these passages and appreciate just what information is being conveyed to the reader. In Judaism, there exists a special type of communion with the Holy One that is vocalic, yet does not use words in any language that is humanly known. This expression takes the form of a vocal melody, where the person begins to utter wordless sounds in a melodious manner, like a song. Such expression is known in Judaism as a NIGGUN, or what would be best translated as a “melody.” What is amazing about this type of expression is that it is not viewed as merely a song, but a spiritual communication, a way of address that surpasses the human tongue’s ability to communicate. This is essentially the topic that Paul mentioned in the above verses, where one is singing “with the spirit.” It can be done with only the wordless voice, or can include instruments along with it, or even sometimes with words from a known language included in some way. SHUVI SHUVI HASHULAMITH SHUVI SHUVI V’NEKHEZEH BAK MAH TEKHEZU BASHULAMITH KIM’KHOLAT HAMAKHANAIM. The intent here of the Hebrew quote in the midst of a lengthy wordless NIGGUN is to speak of the near-dwelling Shekinah Presence of the Most High, by referring to the female lover of the book, the bride who is named Shulamith (Shulamite in English – meaning “Perfect One” / "Jerusalem as a Bride"). This mention in the NIGGUN is intended to express the spiritual yearning for His Presence to return to us so that we might see the interaction (“dance”) between the Most High and His people. While the Hebrew word NIGGUN is a more modern term, its ancient equivalent is indeed found in the text of Scripture as NIGGEYN or NEGINAH. Many Bible versions simply translate this as “play” or “instrument,” which does not aptly convey the spiritual nature of the act of performing a NIGGUN. While musical instruments are typically part of the spiritual event, the word suffers from a lack of a designation that properly communicates the intimate spiritual essence of the act. The literal Hebrew word means “to be touched,” and the reader can view in that the understanding that makes the most sense spiritually. However, it is typically rendered in the sense of just “melody.” That is how I have rendered its presence in the following passages from Scripture that convey the gift of tongues in it. ​And one from his young men replied, and said, "Behold, I have seen a son of Yishai, the Beit haLakhmi, a knower of melody, and a mighty valiant one, and a man of war, and understanding of speech, and a favorable man, and YHWH is with him." None other than David is suggested to help the king’s situation! The son of Jesse the Bethlehemite is here proclaimed to be one who knows “melody,” that is, how to utter a NIGGUN! In fact, out of all the people named in the Hebrew Scriptures, there is only one person of whom it is explicitly said was to have possessed the Holy Spirit by that very designation: David (see Psalm 51:13 (11 in English). To drive the point home even further, David is mentioned along with the topic of a NIGGUN in the Word thirteen different times! David is not the only person recorded in the Hebrew Scriptures to have used a NIGGUN in worship. Psalm 77:7 (6 in the English), specifically names Asaph as having such ability. The context of the passage clearly evokes the idea of spiritual communion, as well. His NIGGUN “melody” was something of the spirit and not the flesh. I do remember my melody at night; with my heart I sing, and my spirit is freed. This should not be too surprising, for 1st Chronicles 25:1 mentions chiefly Asaph and his family who would serve in the Temple by prophesying with music! David wanted people to lead the praising that occurred in the Temple who had the ability to be used by the Spirit to speak in spiritual ways that went beyond the Hebrew lyrics of the psalms. The event of tongues is one that is often on par with prophecy, for it can be a tool of the Spirit to speak to His people. Because of this, the people who would be praising in the Temple needed to be those who were experiencing the living Creator Himself. The connection of the Temple and tongues is also seen elsewhere, in Psalm 68:26 (25 in the English), where we see that such spiritual communication was part of the worship expression in the Temple! Before were the singers, after were the melodists, in the midst were the maidens [with] timbrels. The worship atmosphere in the Temple was ordered but dynamic, as those with known spiritual gifts were present to lift up His name while the people offered their sacrifices to Him. There among the singers and musicians were the “melodists,” that is, those who knew how to formulate a NIGGUN. Their combined praise made the worship experience in the Temple one of incredible spiritual depth. Scripture even shows us that King Hezekiah understood how to reach out to the Holy One with such a gift, for he is recorded in Isaiah 38:20, after being miraculously healed, that he wanted to perform a NIGGUN in the Temple. ​YHWH saved me, and we shall melodize my melodies all the days of our life at the House of YHWH! The text tells us he intended to utter a NIGGUN in the Temple in response to the grace given him by the Holy One. There is no specific psalm that carries his name as the composer, but the information is sufficient here to show that he was aware of the ability and thought himself capable of composing such a spiritual communication to the Most High. These examples from the Hebrew Scriptures show us that the gift of tongues should not be viewed as utterly mysterious, for it is grounded not only in the Torah itself, but is first encountered in the spoken utterance of the Holy One Himself by giving us the Ten Commandments in tongues! Not only did He present His Word to mankind using that miraculous mode of communication, He even imparted it upon His people, as we see evidence of such named Israelites as King David, Asaph, and King Hezekiah being familiar with it and using it to compose beautifully-intimate expressions to Him, and the mention of the unnamed who played and sang in His Temple who were also blessed with the gift. The gift of tongues that was delivered at the Temple during Pentecost / Shavuot in Acts chapter 2 and practiced by believers in the first century congregations is therefore an example of His nearness in the life of His people, showing us that He desires to be in our midst and commune with His kingdom citizens in true intimacy.